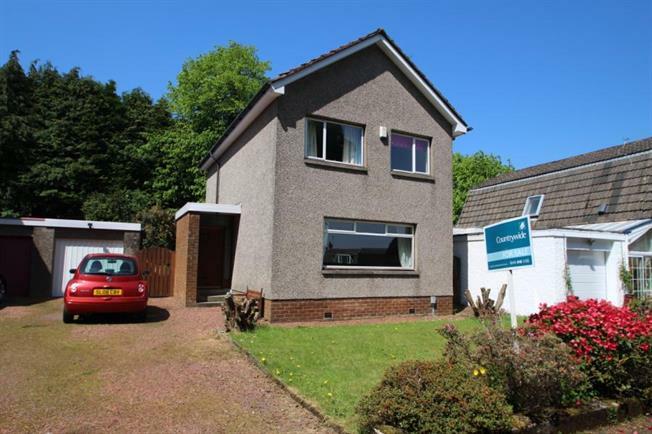 3 Bedroom Detached House For Sale in Paisley for Offers Over £198,000. This spacious and well proportioned, three bedroom detached villa offers ideal family accommodation formed over two levels. This rarely available property is set within a sought after and admired address with the accommodation on offer on the ground level comprising of an entrance porch leading into a welcoming reception hallway. The spacious lounge is impressive and across the hallway is the dining/sitting with patio doors leading out into the enclosed rear garden. The fitted kitchen is adjacent to the dining/sitting room and offers ample storage including a deep pantry cupboard. There is access from the kitchen out to the side aspect of the property. The upper level has three bedrooms and family bathroom. The property sits within spacious gardens situated to the front and rear with a substantial driveway to front leading to a single garage. The specification of the property includes double glazing and gas central heating. The property is well placed to all Paisley's local amenities including shops and schools, local transport links provide quick and easy access to surrounding areas including Paisley Town Centre.